Megha Dhade is a known face in Marathi entertainment industry for being an actress and a producer. She has been working as a child actor in a number of movies and TV shows as well. She has worked in a wide range of Marathi films along with the Hindi TV serials. She happens to be a 29 years gorgeous actress who primarily hails from Jalgaon, MS. She was born in Jalgaon on 23 May 1988 and was brought up in Jalgaon while she is fondly called as Pari by her friends and family members. Since her school days, she used to participate in school drama shows and plays. Though no one from her family happened to be in the field of acting yet she developed her interest since she was in school. Despite coming from highly qualified family members, she dropped out from the college to pursue her dreams to enter into the world of acting. She started her career working early in her teens when she was of age of 18-19. She then was appeared in a number of TV series like ‘Kasautii Zindagii Kay‘, and since then it was no looking back for the lady. She has even appeared in a number of Hindi TV shows as well, which has established herself as an important pillar in the M Town films. Now she is all set to make her entry into the much hyped Marathi reality show called ‘Bigg Boss‘ in the year. Megha Dhade is known to maintain the perfect balance seen in between the modern and traditional beauty. 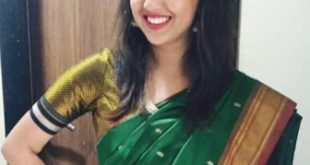 She is seen loving to do a number of things like trying the Indian wear clothes, particularly the Marathi saree called Shalu. She has also carried out herself in the western garments as well. She has done a couple of M Town films along with seen on the reality show known as ‘Zhunj Marathmoli’ released in the year 2014 and the ‘Bigg Boss Marathi Season 1 which is currently running. Talking about her personal life, she is yet to be seen into any kind of relationship as she is willing to focus on her career, which she feels has just started.